A few days ago, this cat showed up on our patio. In years past, cats wouldn't stay long in our yard because our dog would chase them out. 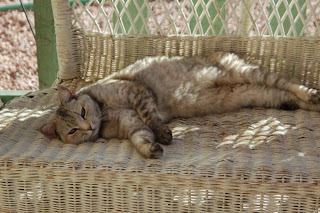 This was the first one I've seen since Julianna died last year, though -- and she seemed rather comfortable! I first noticed her one evening when I was walking through the kitchen. She rubbed up against our patio door and then flopped onto her back, exposing her stomach fully. The next time I walked through she started pawing at the door. I assumed she had a family and didn't expect to see her the next morning. She was still there, however, and N went outside to pet her. I'm allergic to cats, so I told him that he had to wash very well after petting her, and that we couldn't keep her. I was sure she'd find her way home, or to another patio! Another day, and she was still here. The boys were getting attached. DH was asking what were we going to do? When everyone (but L) was gone, I scooped her into a towel and let her out our front door -- thinking she'd go elsewhere. 10 minutes later she was back on the patio! This morning, I began sending out emails asking if anyone wanted a very friendly stray cat, or if they knew of any no-kill shelters with room for cats. I made a few phone calls and wasn't able to find any openings at the local non-kill shelters I could find. Suddenly, I thought of my sister. I was expecting voicemail since she was at work, but suprisingly she answered. I jokingly asked if she wanted a cat. She asked me why, and then told me she had recently been thinking about it. She came over after work, was loved up by the cat, and headed out to buy some supplies. Gemini just left with her new forever family! N had really bonded with the cat and was very upset that she was leaving, but was slightly comforted by the fact that his aunt will be taking care of her. The only glitch might be if the cat has a microchip and needs to be returned to another family -- but we'll find out when my sister takes her to the vet in the next week. We couldn't keep the cat because of my allergies, so I know we did the next best thing for her. I managed to follow through on C and N's thoughts -- now if only we could figure out if she WAS a sign?! As a fellow allergic-to-cats mom, you did the right thing! She IS a cutie though - it would be so tempting to keep her!